PhilaPlace - St. Adalbert Cathedral: St. Adalbert and Port Richmond — Philadelphia's "Little Poland"
St. Adalbert Cathedral: St. Adalbert and Port Richmond — Philadelphia's "Little Poland"
In 1976, the 41st Eucharistic Congress was held in Philadelphia, in which cardinals and priests from all over the world gathered to say mass and hold devotional ceremonies such as the sacrament of the Eucharist. On the second day of the congress, the Polish committee held mass in the Church of St. Adalbert in Port Richmond. The distinguished guest was Cardinal Karol Wojtyła, who would soon become the first non-Italian pope in nearly five centuries. Since the late 1800s, Philadelphia’s Port Richmond neighborhood has been an important destination for East European immigrants, particularly Polish Americans. The Polish became an important immigration bloc around the turn of the century, with more than one million Poles immigrating to the United States in 1900, compared to a mere 30,000 in 1870. The most popular destinations were major American cities, such as New York, Chicago and Philadelphia, where the influx of immigrants was beginning to influence the cultural development of the cities. 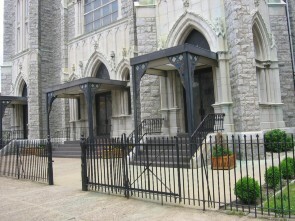 Before 1907, Port Richmond had no Polish-specific church, and the growing Polish community held mass in the basement of nearby Our Lady Help of Christians. 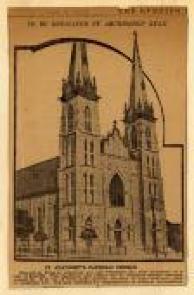 In 1902, the Archdiocese of Philadelphia established St. George to serve the area’s Lithuanian minority, and members of the Polish community believed that set a precedent for vernacular churches. They soon approached Philadelphia Archbishop Patrick J. Ryan to request establishing a local parish of their own. He approved the Church of Saint Adalbert for construction on Thompson and Madison streets. The church was completed in 1907 along with an accompanying private school. Its first pastor was Father Mieczysław Monkiewicz, who spread the word of the new church personally in the neighborhood Polish marketplaces. The church’s original site proved insufficient for the burgeoning Polish community, and it was relocated to Thompson and Allegheny in 1909, where it stands today. The church and school flourished in the new location. In 1946, Father Monkiewicz passed, and Rev. Msgr. Francis Palecki became his successor. Palecki oversaw the church’s Golden Jubilee celebration in 1954, along with the concurrent renovations and repairs to the church, and the expansion of the school to include a new wing and auditorium. In 1964, he was charged with fundraising for the Chapel of Our Lady of Czestochowa at the Washington, D.C. national shrine. Through his efforts, the Archdiocese of Philadelphia was more successful in fundraising than all of the nation’s other Polish communities combined. Rev. Msgr. Palecki retired in 1968 and was succeeded by Msgr. Anthony Jaworowski who served as pastor from 1972-1993. When the 41st Eucharistic Congress was held in Philadelphia, from August 1-8, 1976, Fr. Jaworowski served as chairman of its Polish Committee. On August 2, Polish bishops celebrated a mass and ate a poor man’s supper, a simple meal of bread and stew, at St. Adalbert. One of the principal celebrants, Cardinal Karol Wojtyła became Pope John Paul II, the first ever Polish pope, exactly two years, two months and two weeks after the celebration. In the 1980s Presidents Reagan and Bush paid visits to St. Adalbert. 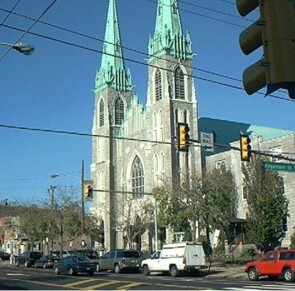 In 2013, the church continues to serve Port Richmond’s large Polish community to this day, offering a combination of bi-lingual, English-only, and Polish-only masses throughout the week. Brożek, Andrzej. Polish Americans, 1854-1939. Warsaw: Interpress, 1985.